Winmate Inc. introduces the new M101BK, a multi-function rugged 8-inch tablet PC with a built-in QWERTY keypad. 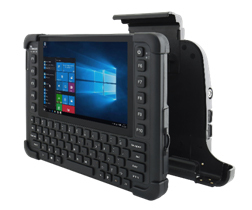 Designed for versatile use in applications such as warehouse logistics, direct store delivery, and law enforcement vehicles, the M101BK is perfect for those that require vehicle-mount computer capabilities with the portability of a tablet. In warehouse logistics, this increased mobility provides several advantages over traditional fixed-mount VMCs. Users will be able to easily transition from forklift to hand use for inventory management. The addition of a QWERTY keypad alongside its 8-inch P-Cap multi-touch display adds practicality for those that require frequent data input and various wireless connectivity options allow for real time updates on inventory and tasks. The wide-ranging power input of the M101BK in a vehicle dock makes it perfectly suited as a vehicle-mount computer through its various RAM mount solutions. Then, when the need arises, the simple one-handed docking/undocking allows for the M101BK to transition to tablet use quickly for data collection, such as barcode and RFID scanning or other on-the-move computing tasks. Its slim and lightweight 1.5kg form factor allows it to be easily used as a tablet for an extended period, and the 6-hour standard battery operating time helps to facilitate this. M101BK’s ruggedness allows for industrial usage in all sorts of conditions. IP65 certification and MIL-STD-810G compliance for Shock, Vibration and Drop means that the device is protected against vehicle and hand use in all environments. Whether for VMC or tablet use, Winmate’s M101BK is a versatile device that will suit all sorts of industrial applications.